Eaton has announced that the 9315 is at it’s End Of Life (EOL) as of September 2017. The recommended replacement for the 9315 is the 93PM. For more information and configuration assistance on UPS replacement, call 1-800-876-9373 or email sales@power-solutions.com. 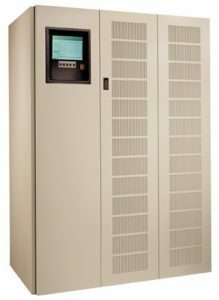 The Eaton 9315 30-160 kVA UPS is a highly reliable and flexible three-phase UPS. The 9315 can be paralleled for both redundancy and capacity using patented Hot SyncTM Technology, for systems up to 3324 kW. It provides maximum flexibility, reliability and system availability for your entire enterprise, whether it’s in a single building or spread around the world. With highly reliable hardware, sophisticated power management software, and a multitude of accessories and options, combined with world class service, the 9315 offers the power solution – and system availability – that lets you get down to the business of your business. Also available for this power range is the Eaton 93PM. This newer generation model represents Eaton’s latest technology with higher efficiency and lower total cost of ownership.